The new Goldilocks and the Three Bears helps celebrate the diversity of loving families. This version follows Mama Bear, Mommy Bear, and Baby Bear as they encounter the timeless character of Goldilocks. 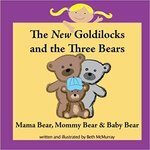 McMurray, Beth, "The New Goldilocks and the Three Bears: Mama Bear, Mommy Bear, and Baby Bear" (2012). DIVerse Families. 326.